KUALA LUMPUR, Malaysia — Media Prima Berhad, Malaysia's leading integrated media investment group, currently owns 100 percent equity interest in TV3, 8TV, NTV, TV9, Hot FM, Fry FM and One FM. Due to the demand of listeners in the east coast communities of Malaysia, Kuala Lumpur-based Hot FM—part of Media Prima subsidiary, Synchrosound Studio Sdn Bhd—recently opened two new regional studios in the states of Kelantan and Terengganu, with four new HARMAN Studer OnAir 1500 digital mixing consoles supplied by local Studer and HARMAN Professional distributor, Mahajak Trio Electronic Sdn Bhd. These are the first OnAir 1500s to be delivered and commissioned in Southeast Asia. 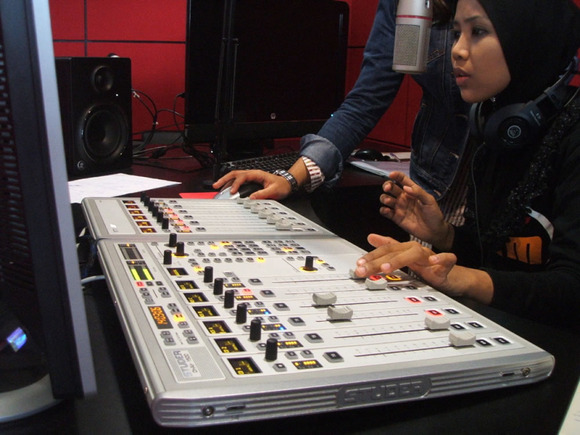 Each station has been built with one main and one backup studio using the Studer OnAir 1500 12-fader console, with the result that Hot FM has quickly become Malaysia’s No.1 station in these eastern states. Since acquiring the Malaysian distribution of all Harman Professional products, including Studer, Mahajak has set about offering a complete one-stop solution to broadcasters. Despite its advanced feature set, the OnAir 1500 console boasts a compact form factor and is super slim for ergonomic table top installation and ease of relocation. The NANO SCore engine frame contains all the control and audio functions, with standard XLR sockets, making any additional breakout panel unnecessary. Future audio expansion is possible with the two separate card slots on the back of the NANO frame. With over 15 years experience working on both TV and Radio projects (including previous projects for the Media Prima Group), Lee Chin Kah understands the precise needs of the customer—a fact readily acknowledged by Keith Prestidge, Sales Director of Studer Asia Pacific. This has enabled the Mahajak Trio team to offer first class product support, including console user and maintenance training, which took place at the station’s Bandar Utama HQ. The station’s broadcast engineers have taken to the new consoles immediately. “They like the easy-to-use GUI, which is critical in a live self-operation studio environment, and the simple installation, as well as the unique touch and action concept of controlling the console intelligently. Advanced features can be accessed quickly, while the intelligent colour coding system will steer the operator to the exact control required very quickly,” Lee reported. The four new OnAir 1500s will now feature as key parts of Hot FM’s daily news and music programming, while taking network feeds from the National Broadcast Centre in Bandar Utama, while each studio can go live and produce local programs for the regional states. Although the consoles are primarily configured as ‘on air’ consoles they are multipurpose in nature, and recording and automation program voice tracking are some of the other applications where they will be used.